Handcrafted in the USA, this slammin' kit from SJC Custom Drums provided an excellent sample source for Big Bang Universal Drums 2. True to their word, these universal drums provide excellent tone, color, and sound for any music project or performance from the worlds of pop, hip-hop, world, funk, rock, or any musical style. 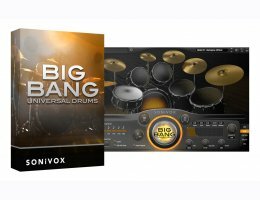 Big Bang Universal Drums 2 has milked every drop of essence from these drums, capturing stick and brush performances from soft and sweet to roaring thunder levels. All programs are presented in a multi-velocity, multi-take round robin format for the pinnacle of realism. This deep level of sampling of attention to detail brings remarkable clarity and an authentic feel to all of your musical creations.